To support your commercial product and clinical trial material release testing needs, Eurofins Lancaster Laboratories offers the capacity and breadth of capabilities to test your drug substance, drug product or in-process materials in a timely manner. Our multi-shift laboratory operations are designed to provide extensive capacity for larger volume release programs, as well as flexibility for smaller programs in a manner that allows for aggressive cycle times. We have in-depth experience working with every type of modality and have the flexibility and extensive instrument capacity within our team to meet the ever-changing demands of production schedules and timelines. 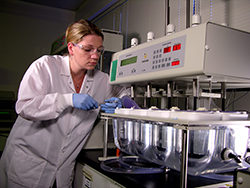 Our breadth of capabilities allows us to perform all testing of even the most complex molecules at one laboratory location, helping to minimize the time between production and release. Our network of global facilities allows us to support your EU batch release requirements.